The Pasta Pit is a small restaurant, seemingly specializing in pasta, that is located in the Desert Kingdom. In The Super Mario Bros. Super Show! 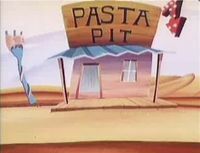 episode "The Great BMX Race", Mario and Luigi, while racing Team Koopa through the Desert Kingdom, decide to stop their racing temporarily to eat lunch at the nearby Pasta Pit. Unfortunately, when Mario and Luigi finish eating at the Pasta Pit, they are passed by Team Koopa, who they had believed to be far away behind them, in their race. It is unknown what the Pasta Pit looks like on the inside, as only the outside of the restaurant is shown; on the exterior, the Pasta Pit simply resembles a wooden shack with a giant fork with spaghetti intertwined on it next to it. A large sign displaying "PASTA PIT" is also located atop the Pasta Pit. This page was last edited on February 17, 2018, at 02:50.